A cavity wall is a double leaf wall having a cavity in between. The outer leaf is generally 10 cm thick and the inner leaf may be 10 cm or 20 cm thick with 5—8 cm wide cavity. The two leaves :are connected together with the help of bonding bricks or metal tie rods. 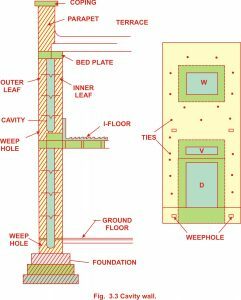 The cavity is extended right upto the foundation concrete sometimes and then it is filled with cement concrete upto the ground .level. The cavity should be upto the roof-level. The bonding bricks or metal ties are placed at a distance of 1 m to 1’2 m horizontally and 60 cm—80 cm vertically in a staggered fashion. doors, windows, ventilators etc. for structural reasons. For the same thickness of material cavity walls are stronger than the solid walls. Cavity walls are damp-proof, sound heat resistant. Cavity walls are nearly 20 % cheap than the solid walls. As far as possible the interior and exterior leaves should be disconnected from each other. Each leaf should have separate D.P.C. layer. Ties should be of rest-proof material. Cavity should be extended from the top of roof to the foundation. The top of the two leaves should be built solid to take up structural loads. Leaf holes should be provided just below the D.P.C.